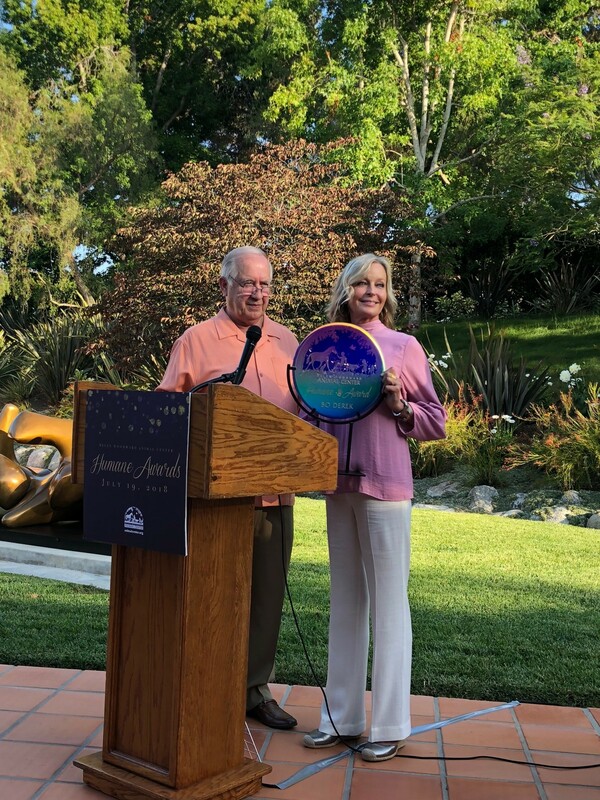 Every year, the Helen Woodward Animal Center recognizes an animal welfare advocate with its “Humane Award.” The recipient of this prestigious award for 2018 was actress and producer Bo Derek, who was honored on July 19 at the home of Rancho Santa Fe resident and animal center supporter Linda Brandes. Regarded for her role in Blake Edwards’ 1970s romantic comedy film “10,” Derek’s unwavering compassion and dedication to helping animals has garnered the attention of animal lovers around the globe. Public Relations Director Jessica Gercke said each year Helen Woodward’s President and CEO Mike Arms selects one person or organization and honors them for the work they have done in the world of animal welfare. “She (Derek) decided she wanted to make a difference in this world — she wanted to make a difference in this life,” said Arms, before inviting Derek up to say a few words. Arms went on to say that after meeting with Derek that very evening, he noticed how their beliefs in animal welfare mirrored one another. Arms said from 2008 to 2015, Derek held the position of commissioner for the California Horse Racing Board, served as a spokeswoman on behalf of the Animal Welfare Institute’s Campaign to put an end to horse slaughter and served as a special envoy of the Secretary of State for Wildlife Trafficking. Derek accepted the award and thanked everyone in attendance who supports the center. She said that when traveling all over the world on animal welfare issues, Helen Woodward Animal Center is recognized internationally. Derek said she didn’t set out to be an activist. But in both her career and travels, it somehow naturally evolved. She said she tends to be pragmatic in animal welfare issues. She needs to understand the problem first, and then seeks a solution. During the evening, guests learned Derek recently launched a shampoo and conditioner pet product line for dogs named, “Bo Derek Pet Care.” A percentage of the proceeds go toward the care of retired military working dogs. The July 19 soiree was invitation-only and in attendance were high-level Helen Woodward Animal Center donors. Also there covering the event was Mark Mathis of KUSI News. Previous recipients of the Humane Award include Diane Keaton, Betty White, Carrie Ann Inaba, Kristen Bell, Jackson Galaxy, Tippi Hedren and Linda Blair.